ALAN GREENSPAN SHAMELESSLY ADMITS RIPPING PEOPLE OFF at secret meeting with BRIT BANKERS in 2002! Back in 2002, when his reputation as “The Man Who Saved the World” was at its peak, Alan Greenspan, former chairman of the Federal Reserve, came to Britain to pick up his knighthood. His biggest fan, Gordon Brown, an EX prime minister, had ensured that the citation said it was being awarded for promoting “economic stability”. During his trip, Mr Greenspan visited the Bank of England’s monetary policy committee. He told them the US financial system had been resilient amid the bursting of the internet bubble. NASDAQ TECH WRECK. Spring 2000. Share prices had halved and there had been massive bond defaults, but no big bank collapses. Mr Greenspan lauded the fact that risk had been spread, using complex derivative instruments. One of the MPC members asked: how could this be? Someone must have lost all that money; who was it? A look of quiet satisfaction came across Mr Greenspan’s face as he answered: “European insurance companies.” (Alan we hardly Knew you!" You qualify as a true FOX RUNNING A HENHOUSE and IMPERSONATING THE FARMER, with an axe behind your back... don't you!" I know, I know, it wasn't ethical. But it worked. Doesn't that MAKE IT ETHICAL? Six years later, AIG, the largest US insurance company, has in effect been nationalised to stop it blowing up the financial world. The US has nationalised the core of its mortgage industry and the government has become the arbiter of which financial companies should survive or die. Where Mr Greenspan bears responsibility is his role in ensuring that the era of cheap interest rates created a speculative bubble. He cannot claim he was not warned of the risks. Take two incidents from the 1990s. The first came before he made his 1996 speech referring to “irrational exuberance”. In a Federal Open Market Committee meeting, he conceded there was an equity bubble but declined to do anything about it. He admitted that proposals for tightening the margin requirement, which people need to hold against equity positions, would be effective: “I guarantee that if you want to get rid of the bubble, whatever it is, that will do it.” It seems odd that since then, in defending the Fed’s inaction, he has claimed in three speeches that tightening margins would not have worked. The second incident stems from spring 1998 when the head of the Commodity Futures Trading Commission expressed concern about the massive increase in over-the-counter derivatives. These have been at the heart of the counter-party risk in the crisis. Mr Greenspan suggested new regulation risked disrupting the capital markets. At the turn of the millennium, with no move to tighten margin requirements, a feedback loop sent share prices into orbit. As prices rose, more brokers were willing to lend to buy more shares. As share prices went up the buying continued, until the bubble burst. To create one bubble may be seen as a misfortune; to create two looks like carelessness. Yet that is exactly what the Greenspan Fed did. Bruised by stock market losses, Americans bought houses. The mortgage industry used securitised bonds to ensure that the people who initiated the mortgage did not worry about getting paid back; risk was packaged and sold to others. This time Mr Greenspan did not just stand aside. He said repeatedly that housing was a safe investment because prices do not fall. Home owners could wait out any downturn. Is it any surprise that so many people thought if the world’s financial genius held this view it must be all right? 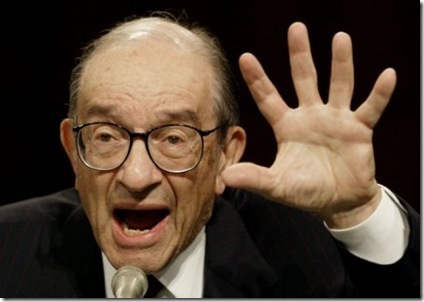 Even as things went completely wild, Mr Greenspan dismissed those who warned that a new bubble was emerging. It was just a case of a little “froth” in a few areas. Later, after waiting until 2007, two years after he left office, he conceded that “froth” had been his euphemism for “bubble”. “All the froth bubbles add up to an aggregate bubble,” he told the Financial Times. This time, as with the equity bubble, the mistake was not to set interest rates too low; it was to stand back as wildly imprudent policies were pursued by mortgage lenders. Indeed, any lender would have been encouraged by his words in April 2005: “Where once more-marginal applicants would simply have been denied credit, lenders are now able to quite efficiently judge the risk posed by individual applicants and to price that risk appropriately. These improvements have led to rapid growth in subprime mortgage lending.” Well, he was right about the rapid growth in subprime lending. Mr Greenspan was in charge of supervising and regulating much of the banking industry for two decades. The Fed says it is responsible for ensuring “safe and sound banking practices”. It is right that other regulators should have stepped in, too – the US regulatory structure has not kept pace with market changes . But given the Fed’s institutional importance and Mr Greenspan’s personal stature, does anyone doubt that the Fed could have used its limited powers to ensure a closer examination of what was going on? Mr Greenspan realises that something big has happened and describes it as a “once in a hundred years” event. But then, you do not get Alan Greenspans coming along every day." POSTER's NOTE: NOT TRUE - HERSHEL GREENSPAN started WORLD WAR II.